Madrid has some of the best day trips in all of Spain. If you are visiting Madrid, you must visit at least one of these. This list of day trips from Madrid should help you decide where to go when you're bored of tall buildings. The question of which of these trips to do when time is limited is hotly debated. Of the two 'main' day trips, Segovia and Toledo, I'd pick Segovia as it's relatively easy to combine it with a half-day in El Escorial or Avila, whereas Toledo is a little more isolated, to the south of Madrid. Madrid is close enough to the famous Ribera del Duero wine region for a day excursion. It also has its own wines. Read more about Wine Tours from Madrid for some tour ideas. Barcelona (by AVE) - The fact that you can visit Barcelona as a day trip from Madrid is an incredible testament to Spain's excellent high-speed train system. Barcelona is the best day trip from Madrid with two major provisos - taking two high-speed trains in a day makes your trip quite expensive, and Barcelona really deserves more than a day. Toledo - The former capital of Spain, Toledo has retained its medieval charm, with its city walls and winding streets. Consider booking a guided tour, or one with a winery visit. Seville (by AVE) - Seville is quite a long way from Madrid, but that's what the AVE train was invented for. Take this guided tour of Seville from Madrid and be back in time for bed. It's the most expensive trip here, but that's because the train tickets are included in the price. Segovia - The twin charms of Segovia's fairytale castle and Roman aqueduct make Segovia an essential day trip from Madrid. Book a Segovia and Avila guided tour or a Segovia tour with winery visit. El Escorial - El Escorial's monastery and kings' crypt (where the majority of Spain's kings for the past 400 years are buried) are a nice alternative to tourist-heavy Segovia and Toledo. 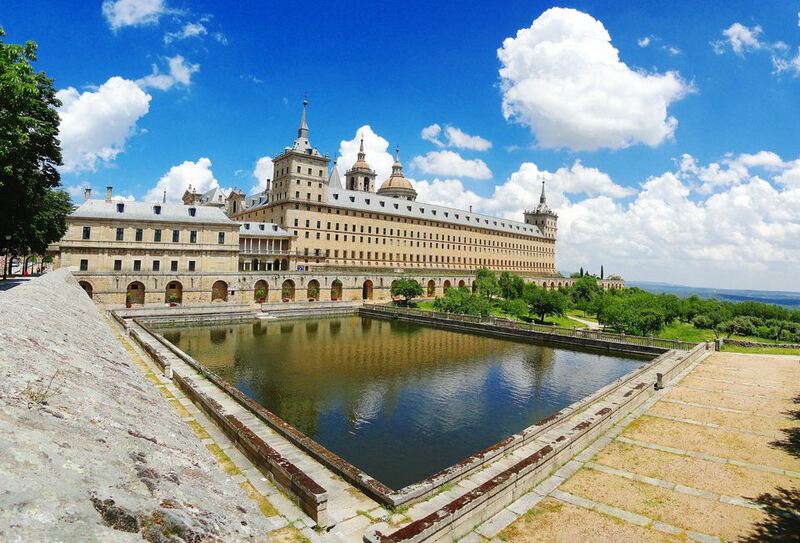 Book an El Escorial and Valley of the Fallen guided tour. El Valle de los Caidos - Controversial burial ground for former dictator, General Franco, complete with magnificent stone cross and basilica, built by Franco's prisoners of war from the Spanish Civil War. Close to El Escorial to make a perfect combined day trip. The English name is 'The Valley of the Fallen' and you can book a guided tour. Note The above tour is highly recommended, as it is not easy to get to see both of these sights in one day by public transport. There is only one bus from El Escorial to El Valle de los Caidos and one back again. If you don't take this tour, you should consider hiring a car. Avila - Often overlooked city between Madrid and Salamanca, with some of the best preserved medieval city walls in Europe. Consider booking a guided tour of Segovia and Avila. Consuegra - Windmills and saffron - two of Spain's most famous sights can be found in this one town. See it all with this La Mancha wine tour with a stop at Consuegra's windmills. Cordoba (by AVE) - The high-speed train from Madrid also passes through Cordoba. It's an ideal day trip from Madrid, or as a stop on the way to Madrid. Consider taking this tour of Cordoba from Madrid by AVE train. Valencia (by AVE) - Madrid's high-speed rail network reached Spain's third biggest city in December 2010, making a day trip to Valencia quite doable. With this development, Valencia also became Madrid's nearest beach. Aranjuez - A royal residence, easily reached by train from Madrid. Consider booking a La Mancha wine tour via Aranjuez. Salamanca - The university city of Salamanca is a bit further from Madrid than many other day trips (two-and-a-half hours away by bus or train) and it warrants at least a night there, but if pressed for time, it is certainly possible in a day trip. Cuenca (by AVE) - Town famous for its 'casas colgantes', houses that hang off the edge of a precipice! Gulp! You can book a high-speed train to Cuenca. Ribera del Duero - Visit one of Spain's two most famous wine regions. Book a tour of Segovia and Ribera del Duero. El Pardo - Country retreat of former dictator General Franco. Warner Brothers Theme Park - Amuse the kids with this movie-themed amusement park. Chinchon - A circular Plaza Mayor and excellent restaurants (much cheaper than in Madrid). Alcala de Henares - Classic university town and birthplace of Miguel de Cervantes, author of Don Quijote. Buitrago - A meeting point of the diverse cultures (Christian, Jewish and Muslim) that made Spain the melting pot it is today. Siguenza - Home to a fine cathedral. The medieval train that Renfe puts on to get to Siguenza is an attraction in itself.